Longboarding is an exhilarating game and attracts people of all ages; some to ride, others to admire the skills and dexterity of pros showing-off their tricks and stunts they can pull off using a board on wheels. In both cases, it is an exciting game to witness. Just like any game, quality of game depends significantly on the quality of the equipment. Trucks are important components of a longboard that allows you to turn and keep the wheels of the board properly attached to the board. Therefore, when choosing a longboard, longboard trucks should also be given due attention to ensure smooth and quality ride that you are looking for. 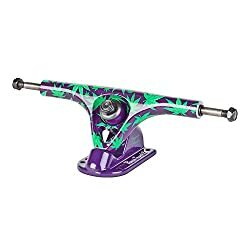 Whenever you go for choosing a longboard truck, there are two things that you should keep in mind while making the purchase, getting best quality in reasonable price and buying trucks according to the type of ride you are inclined to, namely, cruising, Freeride and downhill.Considering above criteria, here is a list of best trucks available in the market. For the cruising style of longboard ride, it is recommended that the trucks should be closest to the width of the deck of your longboard. To get the trucks close to the width of the deck makes it easy for you to choose the right wheels for your longboard trucks and provides you with consistent and smooth ride. It gives you superior quality ride, as the advantage points on your board will be perfectly aligned with your trucks and wheels. While choosing the trucks for cruising style, there are two things that we have to consider. Rules for choosing the most appropriate trucks for your longboard are quite simple. There are two widths available in the market to choosefrom, 150mm and 180mm. All you have to do is to select the truck width that is closest to the width of the deck of your longboard, usually 1/4th of your decks width. Cruising decks that have width less than 8.5” are skinnier decks. For these types of longboards, trucks with 150mm trucks are ideal combination for best riding experience. Carving decks mostly comes with width ranging from approx. 8.5” – 10.5” and up. For such types of decks, you need to purchase 180mm trucks for ideal combination. Cruising and carving style of longboarding is considered best done with reverse-kingpin, which are manufactured and designed for providing wide range of manoeuvrability, and dexterity, which is always desired by longboarding enthusiasts. While, Standard trucks are rarely used. That, though, doesn’t render Standard trucks to be useless or substandard; with a little nick here, and tuck there and bushing up upgrades, Standard style trucks can provide you with effortless turns and smooth rides, just like reverse-kingpin. Reverse Kingpin are mostly used on longboards which are used on boardwalk or downhill race tracks. Reverse-Kingpin is designed to assist and provide more flexibility in turns and manoeuvrability. You will find this style of trucks more in use. Standard Trucks are used for street skateboards. These trucks are recommended to be used for cruising board with kicktails as it let you enjoy sharp response from the use of tail. Freeride is most popular longboarding style among longboarding enthusiasts. Freeriding owe its origins to street skateboarding which allowed riding any way one liked. Main features of Freeride are sliding, early grabs, tailwhips, manuals, flip tricks, techsliding and minor downhill. It incorporates many styles of longboarding in one. Longboarding and skateboarding have been around for quite some time now and so the manufacturers have worked on the functionality of the designs to provide best rides. For freeriding style of longboarding, bushing style of trucks are considered best as it features simplicity and also they have proved best for this kind of rides over a period of time. Reverse Kingpin Trucks are considered best for freeriding style of longboarding whether it is drop-through or drop-platform deck. Reverse Kingpin trucks assists in smooth rides and help in turning and carving styles of ride as well. Therefore, for Freeride longboarding, experts suggest using Reverse Kingpin. Longboard Trucks Baseplate AngleBaseplate Angle choice depends totally on the personal preference of the riders. Some riders, for freeriding, choose trucks with lower baseplate angle (40-45°) which provides more stability during the ride and smooth experience. While others love to live on the edge and want aggressive turns and for that, they like the baseplate with higher baseplate angle (50-52°). Higher baseplates provides more power in forcing the wheels to break traction and start the slide. CTo ensure smooth and ideal riding performance, it is imperative that the width of truck should be as close as possible to the width of the longboard deck. The ideal width recommended for the trucks is 10” or 180mm. This size can vary a few millimetres from the aforementioned size as, such minute difference will not affect the overall performance of the trucks. Downhill longboarding is what the name suggests. Downhill longboarding has been developed over the years and have many options in longboards to improve stability, which is a must for downhill longboard ride. It is an adrenaline-poweredsport, which calls for proper safety gear more than other styles of longboarding for sake of your own health. Trucks for such ride should be chosen while considering the demands of downhill ride. Nowadays, with such advancement in the game of longboarding itself, there is wide range of trucks available in the market to choose from. We have to keep in mind the style of ride we are interested in while making the purchase. For downhill longboarding, whether you have drop-through or top-mount deck, a reverse kingpin truck loaded with bushing suspension and turning system is considered ideal for handlingthe speed of downhill rides. At highspeeds, in longboarding, you need predictable truck behaviour to avoid any unwarranted mishap. For this, Reverse Kingpin provides predictability to the riders and make smooth turns downhill. These trucks can be mounted on both drop-through and top-mount decks. 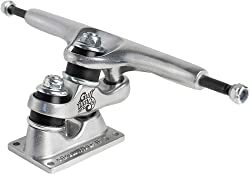 Some professional and intermediate level riders choose precision trucks. They are expensive relatively as they are manufactured differently as compared to cast trucks. Degree of your baseplate plays an important role in determining the kind of turn your longboard will take with specific amount of lean. Highdegree trucks with 50° angle will offer you quick response. On the other hand, lower degree trucks with 40° baseplate angle will offer more stability athighspeed. Lower degree of baseplate can cause complications with wheelbite, so it is recommended that you use 50° reverse kingpin trucks if you are a beginner. As with most trucks, it is recommending highlythat the width of the trucks should be as closely corresponding to the width of your longboard deck as possible. You should be looking for trucks that come under 10” or 180mm category. Plus or minus of few millimetres will not affect the performance of your ride. Gullwing Sidewinder II showcases very unique features, which make it standout in the market. Firstly, it has two separate kingpins, which is going to allow you to have two different points of turn. It will assist you in riding higher. This feature will also let you make turns very nice and tight giving you very cool surfing feeling. Gullwing Sidewinder II is a great carving truck andhelps you push around town in crowded areas as well. Secondly, it allows you to actually take out middle joint and convert it to a single kingpin truck, which will give you a standard kingpin truck, but on a 10” wider truck, which can be fitted to a wider deck for more stable ride. Paris trucks are made super solid and sturdy and can be used anywhere and in any way you want as it can endure any kind of handling and rides. It has been upgraded from the original Paris Trucks. The hangers of Paris V2 Trucks are designed to be stronger which makes it less likely to bend. It features more kingpin clearance in the bushing seat. This feature allows the rider to carve more freely and smoothly. Paris Trucks now showcases new branded grade 8 kingpin to enforce more strength. It is designed with higher quality pivot cup for long life and smoother turns. Bear Grizzly 852 trucks are manufactured and designed to be one of the most versatile trucks. Its unique shape of hanger allows you to flip it over to adjust the performance of the truck according to your style. When you flip it, it is adjusted to lower turning radius giving you a stable ride downhill and assist you in handling high speeds with more control. In addition, if you keep it at standard position, it will help you with responsive turns. Bear Grizzly 852 are designed for almost any style of ride you like. 5” Turbo Speed Trucks comes with 5’ hanger, as the name suggests and 7.63” Axle length. These trucks are ideal for pairing with 7.5”, 7.63” and 7.75” decks and will provide you with excellent riding experience. Metal Alloy finish gives it classy look. It comes with a set of two Mid Profile Trucks and provided with a set of 1” Phillips Screws as well. They are easy to install and can make an ordinary longboard, a better one. They are designed to be strong and durable. 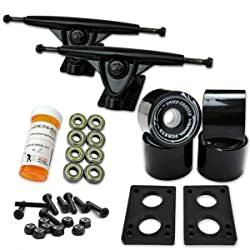 This comes in form of a whole set with wheels bearings, hardware and Risers as well. The trucks are in polished style, black in colour with 175mm HD7 Reverse Kingpin heavy Duty Trucks, made with Aluminium Alloy making it sturdy and durable. Grade 8 Kingpin, 90A PU Bushingprovides more grip and stability during rides. Yocaher Trucks are easily adjustable and can be tightened and loosened at users’ discretion quite easily. These are some of the top-notch trucks available in the market, which are offering great riding experience to the longboarding enthusiasts. Still if you do not find any product of your liking, please click here for many other quality trucks available in the market, which may catch your fancy and may offer better riding experience. Longboarding is an exciting sport and can be taken up at any age. A few things should be kept in mind while making the purchase so that you can enjoy this sport to the fullest. While making the purchase, always keep in mind which kind of style you are inclined to. The trucks make a huge difference in making the ride smooth and offer responsive turns and carvings. Therefore, whether it is cruising, Freeride or downhill, your trucks should be in correspondence to the riding style. Last but not the least, never compromise on the quality of the trucks you are using as they can make all the difference between smooth or a bumpy ride.